There was a sensational finish at The Oval as Glentoran spurned the opportunity to become the first team to defeat Coleraine this season. In the final minute of stoppage time the hosts were awarded a spot kick as David Ogilby tangled with Curtis Allen in the box. John McGuigan stepped up to take the kick and seemingly consign the Bannsiders to defeat. But unbelievably the midfielder lost his footing as he went to strike the ball, and it ballooned over the bar. To be fair Oran Kearney's men deserved a share of the spoils for the way they battled after having Josh Carson dismissed following a challenge on Marcus Kane on 20 minutes. They created several great opportunities as they took the game to Gary Haveron's men, and were a post's width away from keeping their 100 per cent record intact. It was a bright start to the game from both sides. Corey McMullan tested Chris Johns from distance on six minutes. A minute later Callum Birney misjudged a throw in allowing Eoin Bradley to race clear, but his ball in to Jamie McGonigle was smothered by Elliott Morris. The Bannsiders suffered a blow on 14 minutes as Brad Lyons was forced to leave the action following a clash of heads. He was replaced by Ian Parkhill. John McGuigan almost weaved his way through the Coleraine defence on 18, he showed good skill drifting past several defenders before Ogilby brought his run to a halt. 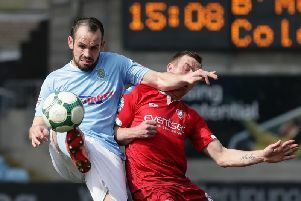 Oran Kearney's men suffered another blow on 20 minutes as Carson was sent off following a challenge on Kane. McGonigle witched to the right-hand side, and he forced Morris into a smart save at his near post on 22 minutes. At the other end Robbie McDaid did well to keep the ball in play, hooking it back for the onrushing Curtis Allen, who fired wide. The visitors were still posing a threat on the break. Morris was relieved to see Parkhill's volley flash past the upright on 31 minutes. Morris had to be on his toes again at the start of the second half as McGonigle surged past Redman before driving a low shot towards goal, which the keeper did well to palm away. At the other end Johns produced a sensational save on 52 minutes to keep the score goalless. He got down well to push away McDaid's point blank header from McGuigan's free kick. Morris was called into action again on the hour mark after McGonigle picked up Mullan's long throw 25 yards from goal before he turned and fired a first time effort towards goal, which the stopper pushed away for a corner. The veteran keeper was called into action again three minutes later as Parkhill latched on to a loose pass in midfield before surging forward and unleashing a rasping drive, which was heading into the roof of the net but for Morris's tip over. It was end to end stuff now and McDaid raced clear, but again Johns produced another excellent stop to parry the low shot. Curtis Allen wriggled free of his marker on 71 and produced a great low ball across the face of goal, which Steven Gordon just failed to make contact with sliding in. Again Coleraine came back and they almost scored a superb goal. McGonigle sent Ciaron Harkin scampering away down the right with a superb pass, and his first-time shot cannoned off the upright, before Harkin fired the rebound over. The Bannsiders went even closer on 86 minutes as McCauley released Bradley, he cut inside beating two defenders, before curling a shot past Morris, but Nathan Kerr somehow got back to head off the line. But the drama wasn't over just yet. A long punt forward out of the Glens defence put Mullan under pressure, and his misplaced header put Allen through on goal before he was upended by Ogilby and a penalty was awarded. But the home support were left exasperated as McGuigan's spot kick flew high and wide of the Coleraine goal.